What happens when you gather coders with privacy and security activists from around the world? Freebird! We held a simultaneous event in NYC and Rio, a one-day barcamp aimed to empower users to be more informed and engaged around their use of mobile technology, while engaging with developers to promote interest in open-source tools, security and privacy. 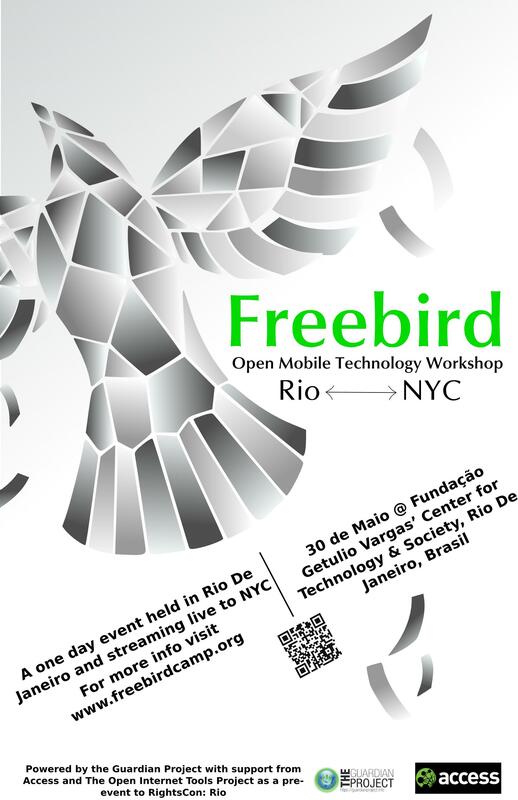 Freebird was a pre-event for RightsCon:Rio, which allowed us to continue and extend conversations and ideas into the larger context of information technologies and human rights. USING: involved expanding mobile users’ understanding of how their phone works, or is working against them, and enabling them to replace the built-in software with more open or secure versions. MAKING: focused on creating new or porting existing security software to mobile platforms, discussion of mobile threat models, and use of mobile technology to assist rights defenders, journalists, and activists. It was a great event with some fantastic discussions and opportunities for new tech and collaborations. Want to re-live the magic? You can check out the pics from Rio and the Storify from the event, as well as the Storify from the NYC event. Also, be sure to check out Brendon O’Brien’s post on the event, Making Privacy Issues Public. From the discussions, it seemed as if there’s still quite a bit of learning that the community has to do about how phones function and all the dangers and complications therein. At the same time, there was a lot of passion and creativity for how to combat invasive tools and better methods of disseminating this type of knowledge and conversation. None of this would have been possible without our partners: Freebird was funded by OpenITP, and facilitated by Aspiration Tech, noted open-source advocates and facilitators. Special guests included developers from Zetetic (SQLCipher), the Tor Project, the Commotion project, and a number of prominent human rights and activists organizations. Thanks to all these great organizations and everyone else who attended. Together, our growing community will help develop the tools and ideas for a tomorrow that is free as a bird.